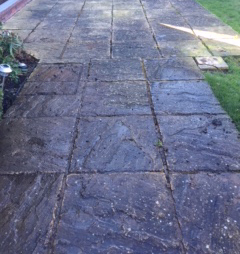 Nigel and the Mow & Go team take pride in providing a high quality service across all aspects of driveway and patio cleaning. We take care through each stage of the process to ensure an outstanding final outcome. Our efficient pressure washing technology allows us to give you a great cleaning solution at an affordable price. 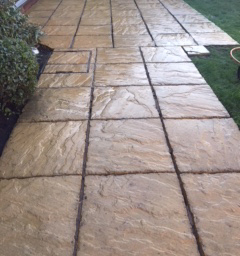 Our high pressure jet washing systems are the best solution for your driveway. The 2 pictures below show a clear example of the high quality finish that our machines can achieve on large patio tiles. Our state of the art driveway cleaning technology allows us to provide a comprehensive service for both commercial and domestic spaces. 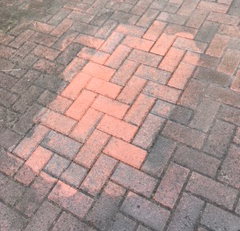 Here is another example of the beginning of a cleaning job that we started on a driveway with smaller blocks.